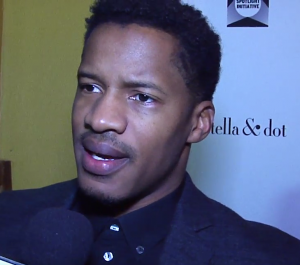 Host Max Tucci caught up with emerging director and actor Nate Parker at the Spotlight Initiative Gala at Sundance Film Festival. The Creative Coalition hosted Spike Lee (Michael Jackson’s Journey from Motown to Off the Wall) and Emerging Director Nate Parker (The Birth of a Nation) at the 2016 Spotlight Initiative Awards Gala along with other honorees Yoga Hosers’ Kevin Smith, Harley Quinn Smith, Tyler Posey and Equity’s James Purefoy, Anna Gunn, Alysia Reiner, and Sarah Megan Thomas. The Creative Coalition’s 2016 Spotlight Initiative Awards Gala Dinner took place at the Kia Supper Suite by The Church Key in Park City, Utah. 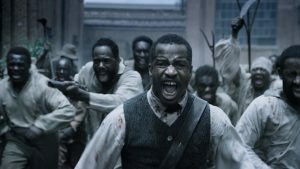 The Birth of a Nation is a 2016 American biographical film about Nat Turner, the African-American slave who led a slave rebellion in Southampton County, Virginia in 1831. The film is written, produced, and directed by Nate Parker, who also stars as Nat Turner. Parker wrote the screenplay and petitioned financiers to invest in the film. It ultimately had a $10 million production budget and was filmed in the U.S. state of Georgia in May 2015. Along with Parker, the film features Armie Hammer, Aja Naomi King, Jackie Earle Haley, Penelope Ann Miller, and Gabrielle Union. The film premiered in competition at the 2016 Sundance Film Festival on January 25, 2016. Fox Searchlight Pictures bought worldwide rights to the film in a $17.5 million deal, the largest deal at the film festival to date. The Creative Coalition (www.TheCreativeCoalition.org) is the premier nonprofit, nonpartisan 501 (c)(3) social and public advocacy organization of the arts and entertainment community. Founded in 1989 by prominent members of the creative community, The Creative Coalition is dedicated to educating, mobilizing, and activating its members on issues of public importance. Actor Tim Daly serves as the organization’s President. The Spotlight Initiative Awards are a prestigious honor in the independent film arena. For over a decade, these honors have been bestowed during the Sundance, Cannes, and Toronto Film Festivals. Recent recipients include Dustin Hoffman, Kathy Bates, Eddie Izzard, and Josh Lucas for Boychoir; William H. Macy and John Hawkes for The Sessions; Kevin Spacey, Demi Moore, Paul Bettany, Jeremy Irons, Zachary Quinto, Penn Badgley, Simon Baker, and Stanley Tucci for Margin Call; Vera Farmiga for Goats; Maggie Gyllenhaal for Hysteria; and directors Quentin Tarantino, Taylor Hackford, George Hickenlooper, Lee Daniels, Roland Emmerich, and Barry Levinson. Other Spotlight Award winners include Sean Penn, Robin Williams, Whoopi Goldberg, Jane Alexander, Harry Belafonte, Russell Simmons, Cicely Tyson, Marcia Gay Harden, Melissa Leo, Elijah Wood, Anna Kendrick, Ellen Barkin, Alan Arkin, Tracy Morgan, Kate Bosworth, Jane Lynch, Shailene Woodley, Alfred Molina, Cheryl Hines, Josh Gad, Jonathan Pryce, and Emile Hirsch, among others. The “Supper Suite” brand and event platform is a pop-up culinary and hospitality haven owned by Los Angeles based special events company, A-List Communications (www.a-listcommunications.com), and programmed at leading film festivals and Hollywood award shows each year. For its 2016 kick-off in Park City, Kia Motors America (www.kia.com) renews as Title Sponsor and will feature its Sorento crossover utility vehicle, while Chef Steven Fretz of The Church Key restaurant in Los Angeles takes over as the culinary partner for this pop-up. Other supporting partners include Maestro Dobel® Tequila, and Johndrow Vineyards.